These are projects that I completed as part of my Bachelors in Science Degree in Computer Information Systems at Trinity Lutheran College. This research project was started as an on-campus Marketing Research and Data Analytics Internship project, and grew into my Senior Capstone Project. It was presented at the 2014 CCSC Northwestern Region Conference. Paper 1: How is TLC.edu being used? 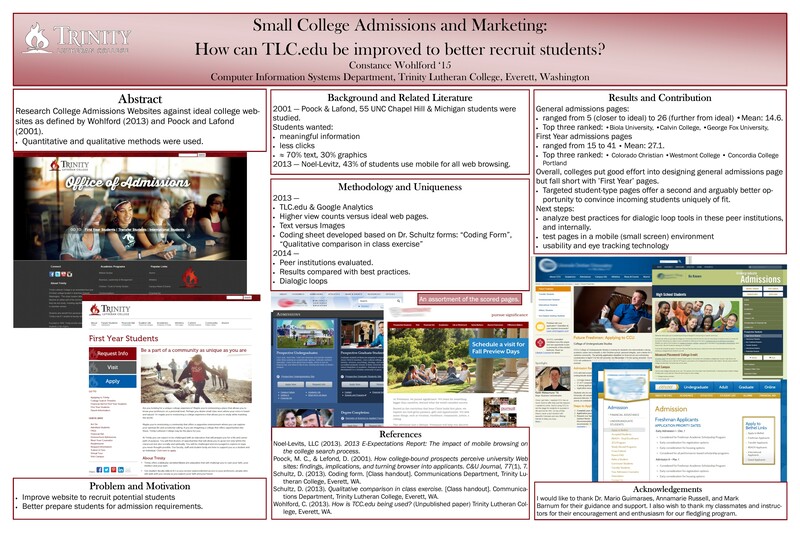 Paper 2: Small College Admissions and Marketing: How can TLC.edu be improved to better recruit students? Using Adobe Photoshop, Illustrator, and InDesign we were tasked with designing and creating marketing materials for an imaginary company of our choice. I chose my fledgling, non-active company "Alpine Daisy". For the purpose of this project I made Alpine Daisy a winter sporting-good and active-wear company. These reports and project are all related to keeping information confidential, accurate, and available. For this project we outlined to options for file backup and restoration; external hard drive paired with One-Drive and Duplicati paired with Google Drive. For this final we created a database to answer questions about our schools class offerings. For this final we designed a database system to support extraneous library borrowing activities. For this project we documented how to enhance Search Engine Optimization. Tools used are Google Analytics and Google Adwords. For this project we used a repository of local weather data and another of global weather data to show that global weather patterns predictably affect local weather. Team members: Jackson Turvey, Vinh Dao, and Norris Li.